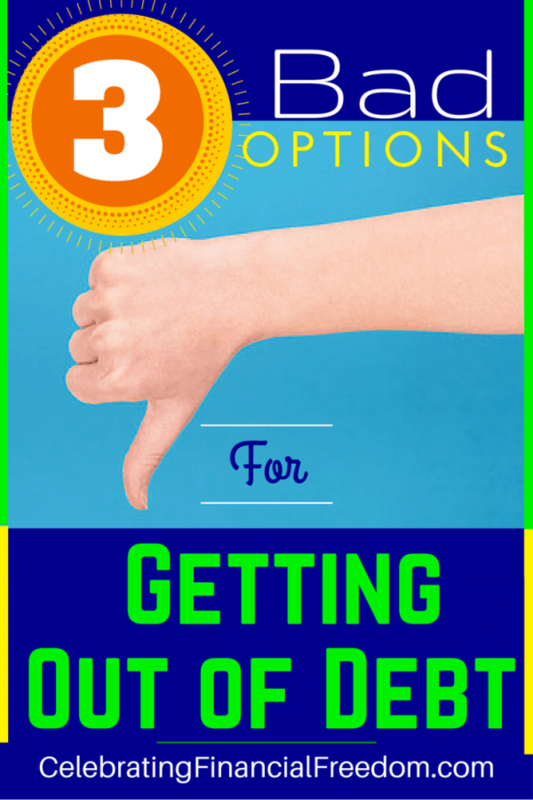 There are a lot of bad options available when it comes to getting out of debt. I know this because I get emails frequently from readers who’ve tried several different options for getting out of debt, but ultimately failed. They end up contacting me because they don’t understand why the method they used to get out of debt didn’t work for them. Because of that, they are now deeper in debt than ever and desperate for help. It’s a very common thread that I’m seeing more and more. It’s because the most popular methods for getting out of debt don’t address the elephant in the room, which makes all the difference. I’ll talk more about this later in the post. Getting out of debt is a big business dominated by banks and companies that want you to use their services to pay off your debt. 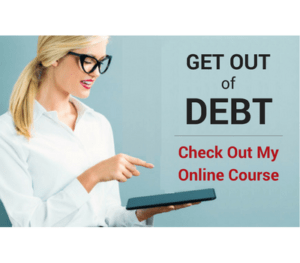 You’ll hear a lot of advertising and a find lot of advice in the media about some of these products and services that are supposed to help you get out of debt and make your life better. But when it comes down to it, they don’t care so much about the outcome once you purchase their product. Basically, their so called solution for getting out of debt is nothing more than a band aid that does little to correct the actual debt problem. The end result is that you can easily end up deeper in debt than you were in the first place, with more stress and heartache to go along with it. Getting out of debt is an investment in yourself and your future. It should be a process that has a lifelong positive effect, not a temporary solution that does nothing to change the behavior that got you there in the first place. Maybe you have tried some of these before, maybe you haven’t. But when you’re armed with the knowledge of what these options are and why they tend to go wrong, then you can make better decisions going forward. 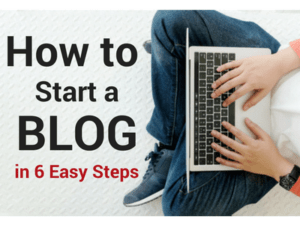 At the end, I’ll also show you a great solution that works every single time when you simply follow the steps. You’ll hear a lot of advertising from finance companies and advice from financial “gurus” about taking out a home equity loan to pay off your debt. The basic concept is that you are trading high interest debt for low interest debt. On the surface it sounds like it might be a good idea. You use the equity in your house to get a low interest loan to pay off your debt. Once you use the money from the loan to pay off all your debt, then you have only one loan payment to pay every month, usually at a lower interest rate than the multiple debt payments you once had. It simplifies the process of paying off your debt and gives you a little breathing room. But there are two problems with that option. The first problem is that now you’re putting your house on the line. If you can’t pay off the debt, you will eventually lose your house. The future consequences of a home equity loan can be devastating. I’ll cover the second problem with home equity loans in a minute after letting you know about a couple more options you have, as all these options share one common problem. Debt consolidation is a huge industry with a lot of advertising dollars behind it. It’s hard to turn on the TV or radio without hearing an ad for a company selling this service. The basic gist is that you pay the company to negotiate “better” terms on your debt. This is supposed to lower your overall monthly payments. The first problem with debt consolidation is that these “better” terms are really not better at all. The usual way they are able to lower your monthly payment is by extending the payoff time. The net result is that instead of paying off debt in 2 years, it might take 4 or 5 years. In the end you end up paying more money in interest and fees because of the extended payoff period. Bankruptcy is a difficult, painful process that will follow you around for years. It can disqualify you from renting a home, buying a car, getting a job, and getting other things you may need. It will also trash your credit score. In many situations bankruptcy may seem like a good option to get rid of your debt problem. But when it comes down to it, there are problems with this option too. You will need an attorney to guide you through the process, and that costs a significant amount of money that digs the hole deeper. Also, bankruptcy has one basic problem that all the options above share. The biggest problem is that none of these options do anything to change the money behaviors that got you deep into debt in the first place. So many people use these options believing it’s going to be the solution to their problem. But once you get a little breathing room in your finances, you eventually end up deeper in debt because you never changed the behaviors that got you there in the first place. It’s a cycle of debt that gets deeper and more vicious the further you go. Here’s a list of my articles on Behavior Change that might be of help. Maybe you’ve tried one or more of these options and they didn’t work out as well as you’d hoped. We all have experiences to build upon and learn from. How can you make your financial situation better and beat the cycle of debt that so easily takes hold? You have to learn to change the behaviors that caused the debt in the first place. Lasting debt freedom can only happen if you can recognize and take responsibility for the behavior that got you there. Once you recognize the need for behavior change, then you have to do something about it. This is where so many of the popular get out of debt solutions fall short. You absolutely MUST have a plan that allows you to easily change what you’ve been doing and gives you a path to develop new habits going forward. That’s why I believe the Celebrating Financial Freedom course is such a good solution for getting out of debt. 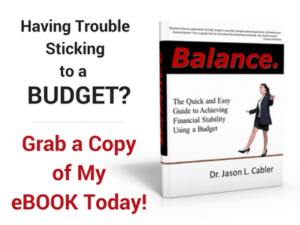 Not only does it show you how you’re manipulated to get into debt in the first place, it also shows you every step you need to put together your own customized, easy to follow plan that allows you to change your money habits. You can find out more about the Celebrating Financial Freedom course here. It’s a small investment that pays for itself many times over. It results in permanent behavior change, saving you stress, frustration, and many thousands of dollars over your lifetime! Question: Have you ever tried any of these options for getting out of debt? How did it work out for you? As a person that paid off $109,000 in credit card through a debt management program, we agree to disagree that debt consolidation is a bad option to get out of debt. 🙂 I’m sure you knew I’d show up with my comment. I do agree that if someone goes down that route, they do need to address the behavior that got them there in the first place. Ha Ha, I knew I’d hear from you on this on Travis! I know you’re experience has been different than most, and ya’ll have done a great job at changing the behaviors that got you so far into debt in the first place. The reason is because you took the bull by the horns and did what you had to do to make a change. I think that too many debt consolidation providers advertise it as more of an easy way out and leave it up to you to figure out the behavior thing on your own. That’s why a lot of people end up deeper in debt after debt consolidation and other “solutions”. They get a little breathing room, continue the same behavior, and dig the hole deeper. If there were more providers who used counseling as part of their service, I think more people would be more successful at getting completely out of debt. Didn’t your program have some sort of counseling or accountability along with it, or did I just dream that? they had resource available to help people build a budget and to give tips on saving money……but it wasn’t required. That’s good, more people should opt in to that when it’s available.